September 16 – 17 – 18 – 19: Nothing much of importance happened during these days. I have to help Pa some and get put at rolling for one thing. Of course I had my mishaps even to going off of the roller. That work is all done by this time. This was the fourth of four days where Grandma wrote a single diary entry. Three days ago I described how Grandma rolled the fields in preparation for planting fall wheat. And, two days ago and yesterday, I shared pictures of large and small wheat farms from a hundred-year-old book. The 1908 book, The Book of Wheat by Peter Tracy Dondlinger, had lots of interesting information. One part I really enjoyed was the description of wheat production in several other countries. I’m going to share what the book said about Russia. Within the larger historical context it is fascinating to read something about Russia that was written in the years prior to the Russian Revolution and the formation of the Soviet Union. Viewed solely from the point of view of its natural resources and economic aspects, Russia is the United States of Europe. It has immense undeveloped areas that would form ideal wheat lands, lands very similar to those which constitute the wheat belt of the United States. The similarity between Russia and the United States in the natural resources of the wheat growing regions is quite equaled by the dissimilarity of political practice, social theory and economic condition. The Russian peasantry had had neither means nor opportunity to attain a higher plane of life. The poor system of land ownership and the antiquated methods of agriculture made Russian wheat a dear wheat in spite of cheap labor and a low standard of living. The future possibilities of Russian wheat production depend upon the social, economic and educational progress of Russia. There are symptoms of improvement in this direction. The extension of peasant land ownership is improving economic conditions. It seems that political and social conditions are at last changing and popular education is growing. In agriculture, better machinery is being introduced, and the crops are being rotated. Posted on September 19, 2013 September 18, 2013 by SherylPosted in Farming and GardeningTagged diary, family history, wheat. This really is interesting, especially how Russia is judged solely by comparison with the US–seems like comparing apples and oranges, since the countries were so different. 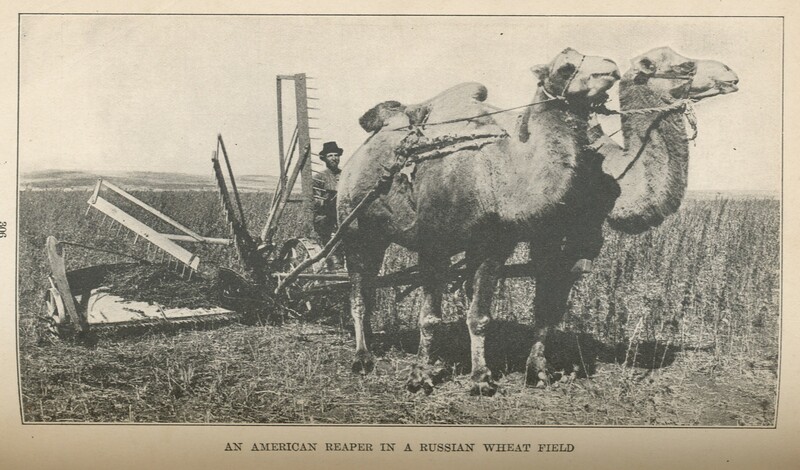 I wouldn’t have expected camels to do that type of work in Russia. Interesting! Who knew camels could be used this way? I always learn something from your blog! Camels, certainly did not expect to see them helping with farm work. How fun would it be to have camels to work on your farm? I would imagine land ownership was a challenge in a communist country. Everything being state run or owned but they still became a super power. Interesting. I’m reading Anna Karenina right now and your post on Russian Wheat Production fits with the agricultural theme in the book.